Railpictures.ca - Stephen C. Host Photo: A nice three pack of, at the time, nice looking and clean SD75′s leads train 148 down the hill at Copetown. The shack is for a ‘switchtender’ ? whose sole job was to monitor track conditions as there is an underground river/lake of some kind at this location. In the last few years some major underground water management system was installed in this location.. and there remains detectors here for sinkholes in case of a problem. Curious if one has ever happened.. | Railpictures.ca – Canadian Railway Photography – photographie ferroviaire Canadienne. 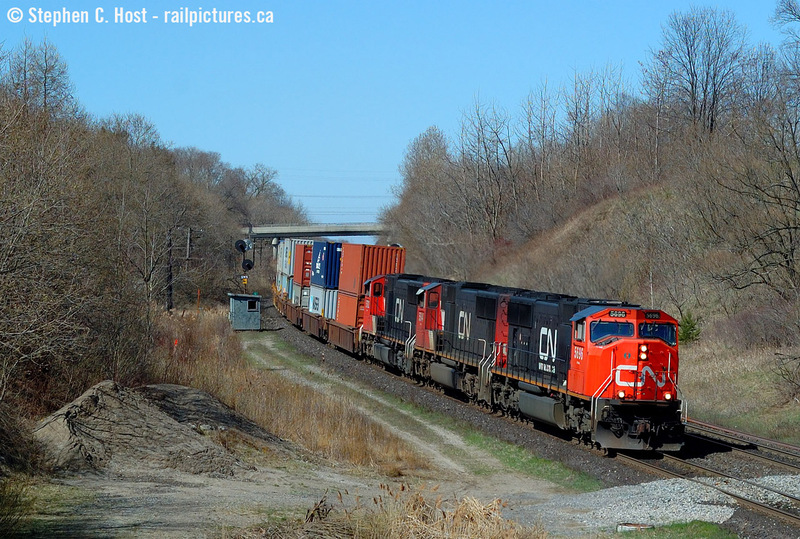 Caption: A nice three pack of, at the time, nice looking and clean SD75's leads train 148 down the hill at Copetown. The shack is for a 'switchtender' ? whose sole job was to monitor track conditions as there is an underground river/lake of some kind at this location. In the last few years some major underground water management system was installed in this location.. and there remains detectors here for sinkholes in case of a problem. Curious if one has ever happened.. Here is the where the shack in your photo ended-up two years after you shot the train going by it. You are making me miss being behind the throttle mister. Great shot. To answer your question, yes and no. The switchtender and track monitor were there for sinkholes and for washouts and high water levels. I don’t remember a sinkhole happening , but i do remember many high water alarms and at least 2 washouts where ballast cars had to be rushed to the area to shore up the tracks to get trains moving again.